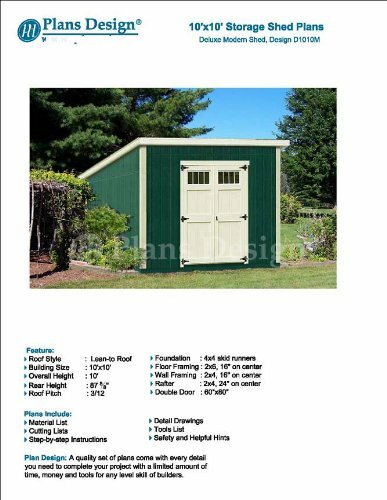 Rear Height : 7'-1 3/8"
Plans are for a simple Modern storage shed, ideal for the beginner who wants a shed with lots of space and is a cut above the mass produced versions on the market. This shed design offers maximum storage volume for minimum in material cost and has single profile roof for smaller urban yard. Many designs also include feature two small door transom widows to let sun shine in as well as large double doors on the front for easy access of all your gardening equipment and tool.